We opened our Fukuoka Office on July 1, 2013. 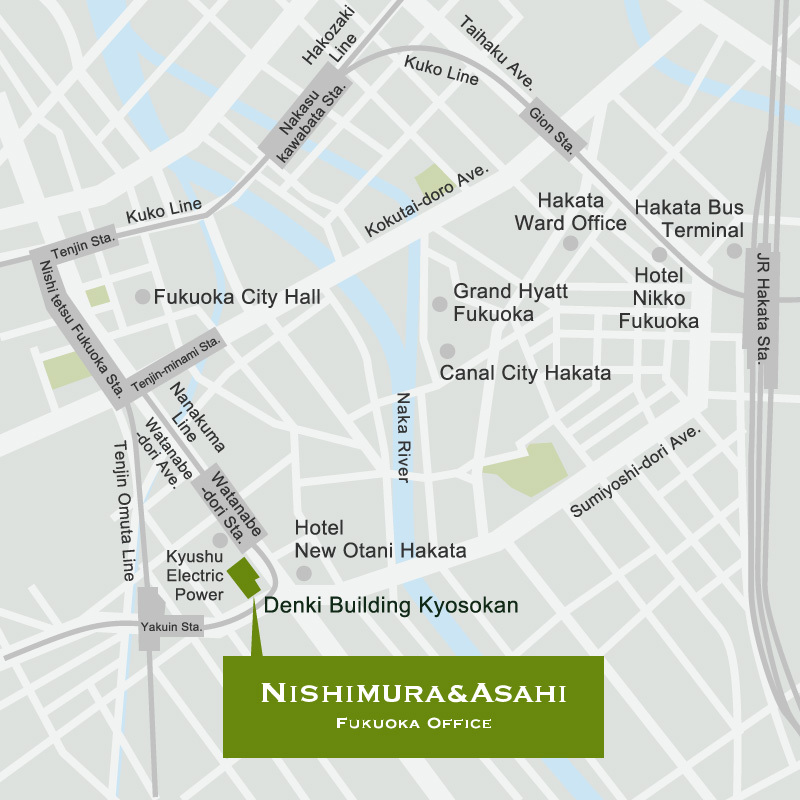 As a branch office of Nishimura & Asahi Law Firm, the largest law firm in Japan, our Fukuoka Office is strategically situated to provide fully integrated legal services to businesses in the Kyushu, Okinawa and Chugoku areas. Currently, our Fukuoka Office has seven lawyers including US qualified attorneys. Striving to provide a seamless and high-end “one stop service” to our clients, the Fukuoka Office is fully integrated with the firm’s other domestic and overseas offices in Tokyo, Nagoya, Osaka, Bangkok, Beijing, Shanghai, Hanoi, Ho Chi Minh City, Jakarta*1, New York, Singapore, Yangon, and Hong Kong*2, and works closely with the firm’s network of selected local law firms all over the world. The practice areas of the Fukuoka Office include domestic and cross border mergers and acquisitions, finance, crisis control and management, compliance, bankruptcy, civil rehabilitation, intellectual property, corporate litigation, dispute resolution, venture, tax, and labor matters. From the everyday legal issues businesses face to highly specialized legal matters, our Fukuoka Office provides high quality legal service with added value to our domestic and global clients. In particular, our Fukuoka legal team is well equipped to handle complex transactions across legal disciplines and practice areas, as well as short duration matters that require intensive time commitment. We are also experienced in assisting businesses with building and expanding overseas operations through outbound transactions such as mergers and acquisitions, as well as providing advice on the handling of corporate scandals and compliance issues that may result in serious damage to corporate reputation. In addition, our Fukuoka Office has very strong capability in the areas of corporate reorganization, liquidation and insolvency proceedings.